Last week Beijing saw its infamous smog thicken to unprecedented levels, driven largely by emissions from coal-fired power plants across China. In recent years coal from US mines has stoked more and more of these plants, in effect offshoring the health impacts of burning coal. This year, much of the US coal industry's focus will be on pushing an unfolding campaign that seeks to dramatically ramp up the amount of coal we ship overseas. Morrow County, Oregon, is a quintessientially green pocket of the Pacific Northwest. It's capped by the Columbia River, which winds past the hipsters in Portland en route to the sea, often carrying schools of the salmon that have long been an economic staple for locals. But Morrow County could soon become a backdrop for the transformation of the US coal industry, if a planned loading zone for massive shipments of coal-harvested in the Powder River Basin in Montana and Wyoming, and packed into Asia-bound cargo ships-gets final approval. Right now, local, state, and federal lawmakers are hammering out the details in what is unfolding as one of the biggest climate fights of 2013. The Port of Morrow, where coal would be transferred from inland trains onto outbound river barges in the small town of Boardman, is just one of five proposed new coal export terminals now under consideration in Oregon and Washington. If built, the terminals could more than double the amount of coal the US ships overseas, most of it bound for insatiable markets in China, India, South Korea, and a suite of other Asian nations. Building the new West Coast terminals could be a matter of life or death for US coal. It's the next giant leap forward for the US coal industry, which has in recent years turned increasingly to the East as domestic demand dwindles and Obama-era clean air regulations make it next to impossible to build new coal-burning facilities at home. But Big Coal's ability to sell its wares overseas is increasingly bottlenecked by maxed-out export facilities, most of which are on the Atlantic-facing East Coast, anyway, better situated for shipments to Hamburg than Hong Kong. So, says Brookings Institute energy analyst Charles Ebinger, building the new West Coast terminals could be a matter of life or death for US coal. "There's a lot of coal in the domestic market that can't be utilized," Ebinger says. 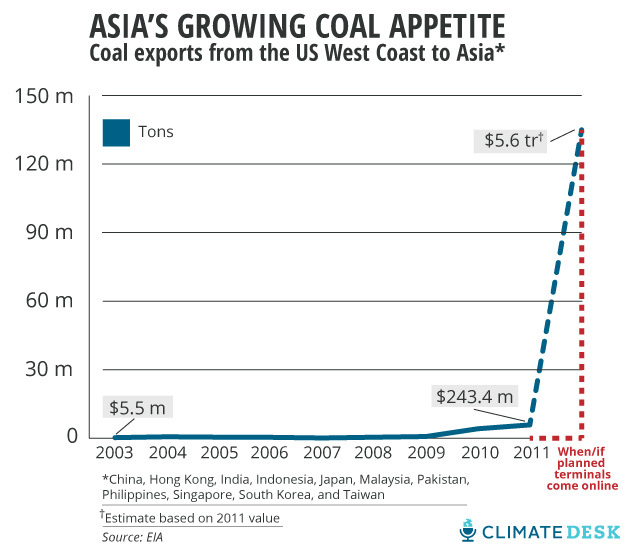 "The Asian market is the fastest-growing coal market in the world. If we wish to continue to export coal [these terminals] are very important... whatever volume of coal we could export would find a market." But as important as the terminals are to the coal industry, they've run up against a wall of resistance by everyone from local environmentalists to Oregon Senator Ron Wyden (D), who has vowed to use his seat at the head of the Senate Committee on Energy and Natural Resources to hold the terminal proposals to a rigorous environmental accounting. "I've never seen such passionate opposition to a proposal as I've seen to coal export," Brett VandenHeuvel, director of local environmental group Columbia Riverkeeper, says. A new Greenpeace study, released today, ranked the terminals as the fifth dirtiest proposed energy project in the world, under Arctic oil drilling but above US fracking and drilling in the Gulf of Mexico, finding that the increased coal use they would facilitate would, by 2020, dump some 460 million tons of carbon dioxide into the atmosphere every year. This echoes an EPA finding last year that the Port of Morrow terminal would pose "significant" local public health threats. There are still a few hoops to jump through before any of the terminals could break ground; but with so much profit at stake, this is one climate battle that's only getting started.